Fortunately we got lucky and I don’t think that we had a single person enter more than once. But you live and learn. If I ever run a Twitter competition again, I’ll be sure to include that clause – and in fact I think that I’d also spend more time on creating and fine-tuning the competition’s terms & conditions in order to make sure that nothing can trip us up later on down the line. One of the perks of running a competition such as this is that you can add the competition to a number of dedicated competition/giveaway websites – resulting in juicy, juicy links, which can help out on the SEO and inbound marketing side of things. I actually held off on using competition websites at first, mainly because I wanted the competition to grow organically. But despite our best efforts to promote it, it took a few days to get our first eligible entry and over a week to get three (enough to give one prize to each entrant), at which point I began to panic. So I added the details to a few competition websites, with the competition making it onto at least one of them. Suddenly, we had another 70(!) eligible entries in a week – the final week that the competition was running. Sounds good, right? Well… Before that, we had 9 eligible entrants, all of whom were South Wales-based and with the majority working in IT – so very relevant to what the campaign (and the company) was all about. 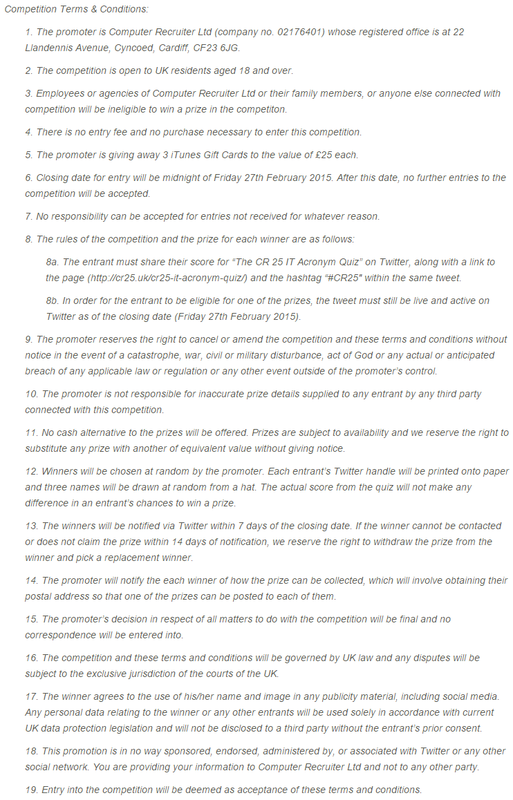 The later 70 entries were random people across the UK who mostly (or only) ever use their Twitter account to enter Twitter competitions. It felt… soulless. See what I mean? Her Twitter feed – and many of the feeds of others who came through the competition sites – look a lot like this. 99% of their tweets are competition-related. Additionally, the original 9 entrants were more ‘involved’ with the quiz and the competition: scoring high was important to them, with one participant commenting (via @mention) that he had to try the quiz more than once in order to get a perfect score of 10 out of 10. A lot of the later 70 entrants seemingly didn’t care what score they got, ranging from anything as low as 3-4 and with only a handful scoring 10 – it seemed to me that they just wanted to enter the competition and be on their way (as it didn’t matter what score they got – in order to qualify for the competition, they simply had to tweet the score, no matter what it was). Yes, it meant that we had a healthy number of competition entries in the end, and yes, it resulted in a link or two, but if I were to do it all again, I wouldn’t have submitted it to competition websites – unless I was running a UK-wide competition and one of the goals was to get as many entries as possible. I don’t mean to sound ungrateful about those later 70 entrants, but in hindsight, it didn’t seem like the right move to submit the competition to those types of sites. 12. Winners will be chosen at random by the promoter. Each entrant’s Twitter handle will be printed onto paper and three names will be drawn at random from a hat. The actual score from the quiz will not make any difference in an entrant’s chances to win a prize. I thought nothing of it at the time, but when it came to actually drawing the quiz, I was kicking myself – why didn’t I just say that I’d use some online list randomiser? It would’ve saved so much time. But the more I thought about it, the more I liked the appeal of doing a proper draw. So I decided to make a thing of it. The beauty of working at Welsh ICE (a co-working space and my ‘base’) is that we all like to help each other out. I asked to borrow an iPhone stand/tripod and a hat from my fellow members, and a videographer (Owain of Tree Top Films) kindly offered to lend his equipment so that I could film it properly (originally I was simply going to use my iPhone to record the videos). The business that lent us the hat (RecRock) offers music tuition, including drum lessons, so I asked if I could also borrow a snare drum, cymbal and drum sticks so that we could do a proper drum roll. While they were happy to oblige, they were busy, so one of their students – who also works up at ICE running his own business (Cosmic Anvil) – volunteered to do the drum roll. I then used Windows Movie Maker (which is free to download) to edit the videos, turning up their brightness and cropping them at the beginning and end to a) make them shorter and b) cut out our voices either side of the draws. I uploaded them onto YouTube – privately at first, then making them public when we published the tweets. This way we could show that the competition was legit, plus we had an excuse to tweet about it – with the videos appearing in-stream for followers of @ComputerRecruit. The freelance videographer also suggested adding them to Facebook, as videos published on Facebook auto-play in people’s feeds. So I combined all three draws into one video using Windows Movie Maker and put it on Facebook, too. So while it might take more time to do a proper ‘draw’, it gives you the excuse to make a thing of it – to turn it into a spectacle, an event. There we have it – those are my three lessons. Here’s to many more Twitter competitions – and therefore many more lessons…! Have you ever run a competition? How did it go? What did you learn? Drop a comment below. What a brilliant, honest post about your experience! And very useful. Competition sites are excellent for bumping up the figures, but as you say – us compers usually make poor future customers! It’s better to target prospective customers via Facebook or perhaps an email list – the problem being, most non-compers are so cynical about competitions they don’t bother to enter! I’m on a bit of a mission to encourage more ‘normal’ people to understand that most giveaways ARE genuine and have genuine winners…. and as you’ve shown here, can be lots of fun too. Good luck with your next promotion! Thanks Di. 🙂 You’ve hit the nail on the head there: compers may not be interested in what your business does (only in getting the prize) and actual potential clients/candidates might think it’s cheesy and not want to do it! It’s tricky getting the balance right – that’s for sure. The great thing about us “compers” entering your competitions is that you get a huge amount of publicity. You can almost guarantee that each “comper” that enters the competition has a friends list / followers full of other “compers”. That publicity is free. It can reach 1000s upon 1000s – especially if the prize is right. And, I would say, iTunes vouchers are a good bait – anything like that normally attracts people. I have run competitions on my blog, my facebook business page and even with the locals. You are right, the rules need to be clear. And never forget the important one – “I have the right to amend these rules as needed”. That can be the life saver if you realise you’ve missed one out half way through! Good luck with your future competitions – there are a few loony “compers” out there that may scare you into thinking we are all crazy, but we’re not. I am what might be termed a comper. If you look at my twitter feed, 99% of it is probably competitions. Having said that every comper also a consumer. We do have to buy products and services and through entering competitions, I have found some products and services that I love that I would not otherwise have known about. Also, for no other reason than the fact that I enter competitions, I have around 1500 followers, including a lot of household names, so if I enter a competition, they all have it pop into their twitter feed, so the word of your promotion will spread. So I think that it really all depends on what you are seeking to achieve when you run a competition. You might have 99 people that have little interest in your product or service, but you might gain one very useful contact or customer. Good luck with any future promotions that you do. As a comper I have to say that majority of the stuff I buy now has been because I found a small company, tried their products, loved them and bought more. Some were wins, some were not, but loved the idea, the feedback from other winners and had to buy whatever it was. As a blogger that runs competitions it doesn’t bother me who enters. Everyone has a right to enter a competition. I can actually see where your coming from (as a somewhat comper) It is a tough balancing act between quality and quantity. I don’t think compers as such are bad repeat customers, granted some are happy to spam any old competition regardless as you found out, but most are entering things that interest them and with companies that interest them. They will likely then remember the company when it comes to needing that product or service. From the clothes in my wardrobe right down to the coffee I drink has been influenced by competitions so they can work. I find it ironic that the lady putting compers down is the same lady who a few months back was all over the press telling the whole world how easy it is to win loads of stuff by comping. I’m sorry but professional competition entrants DO NOT give two hoots about your brand and specific promotion. They sit their all day entering for anything and everything and sadly most lists or data these days are infested with these professional entrants, making the raw data worthless to business campaigns. But for a niche or local business, it’s better to engage a smaller range of genuinely interested people with a more specialist and relevant prize – rather than encourage 10,000 compers to enter to win a prize like an iPad or iPhone. I’m a comper, a promoter AND a blogger and I have enough experience to see it from different angles. I remember running a tricky and fun (well, I thought so!) picture quiz for a client a couple of years back – a comper posted the answer on MSE. It was the wrong answer and VERY obviously the wrong answer, yet 250 other entrants copied it without stopping to think. 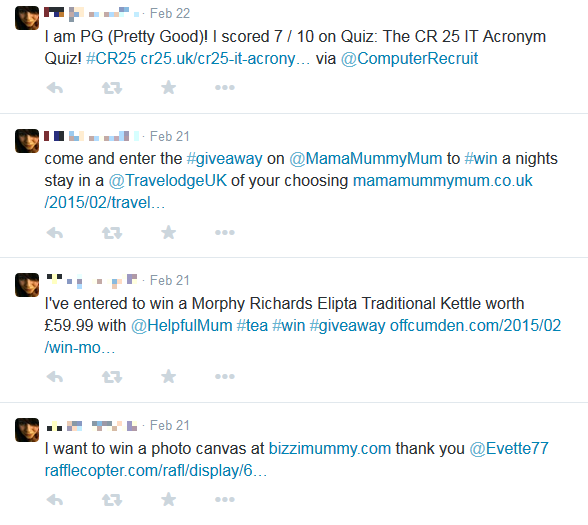 That’s the type of compers you DON’T want to attract to a giveaway – whereas the guys who have taken the time to comment above are (hopefully) the ones who see it as a fun, social hobby rather than a production line of prizes. And yes, lots of compers DO spread the word about great promoters and products and become future customers – but they do a much more effective job for national brands rather than a small, local specialist company…. Some excellent points here, Steve, very well done. I know exactly how you feel with regard to the competition websites – there are people who simply stay home and enter competitions and apply for give-aways all day. Stay-at-home mums, maybe? But yeah, not great or relevant entries, really. Kudos for the honest post, Steve. Not many people acknowledge their mistakes over the internet. Running competitions seems a fairly easy thing to do, but if you are a rookie there are actually quite a few things to think about. I also totally agree with you about entering the competition in promotion websites – depeding on the purpose of your competition – whether you want to put it front of the eyes of many people and improve your brand awareness or you are looking for genuinely interested people. Congrats on the successful first try and I am sure you will do even better next time. Well, interestingly enough I have requested someone to run a comp / giveaway for me as I’m a Rookie (definitely ) & wish to see how it might work-out. Like thousands of fledgling online outfits I’m keen to draw attention & interest to products we are introducing which are marvellous, wonderful, unique and fabulous – no honest, they really are. Have tried paid for Google & Facebook campaigns with observable effect – but would prefer more organic/viral outcomes obviously. So it will be interesting to see what if any impact/interest is generated over the next 30 days – target audience is general human beings in the UK, who might spend on Natural, Organic, Vegan, Diabetic safe products rather then just say – regular gear down on the High Street – so quiet a wide inclusive brief.